Last night I cycled straight to the lake after work. When I got there Stu was waiting with my swimming kit, so I got changed as quickly as possible. The water felt a bit chilly as I got in, but I think that’s because it was very warm outside and I had been standing around with my wetsuit on for too long. After a minute or two of floating, I decided to start swimming. 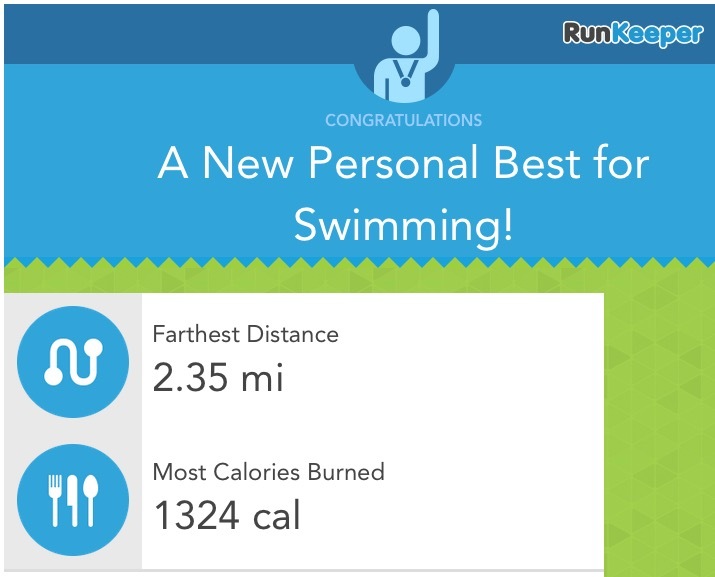 My last long swim was 10 laps of the lake, but I’ve got a 5km swim in just over a week, so I wanted to push myself and go for 12 laps, which would be about 4.2km. I decided to aim for a more continuous swim than last time as I need to get used swimming non-stop. My plan was to swim 4 x 3 laps. I quickly got into a rhythm and decided not to look at my watch. After three laps, I was feeling strong, so I decided to do four laps. By the time I had done four laps, I was feeling good, so I changed my challenge and went for six laps. After six laps, I was still feeling good, so I decided to push on for as long as I could. I could feel that my wetsuit was rubbing my neck (I had failed to put any bodyglide on), but decided to push on as there was nothing I could do. By lap 9, I was starting to get tired, but I realised that my longest ever continuous swim was in my sights, so I pushed on. At the end of lap 10, I saw Stu getting ready to get out of the lake. I thought about speaking to him, but didn’t want to stop, so I gave him a smile and carried on. This weekend, I’ve got my first sea swim of the year at the BustinSkin Gu Weymouth Triathlon (1500m) – I hope I can beat my time from last year. Next weekend, I’ve got a 2.5km sea swim and a 5km lake swim. I might be slow, but I think I can do this! Great job!!! That easily beats the IM cutoff. Your swimming is getting stronger and longer! Way to go! Nice PB. Like Dorey says just keep swimming. What’s made you smile today?